Prague is a wondrous gothic city with so many twisting and turning streets to explore. In the last 15 years it has really been discovered as a tourist location. Naturally, the result has been that a lot of pretty cheesy tourist pubs and bars have arisen to meet the tourist demand. Do you want to be the kind of traveler that hits the clichéd spots? Or, do you want to find a few of the cool places that locals actually recommend that you go to. If you’re of the latter grouping the following selections will give you some choices of places that locals of Prague really go to and enjoy. Though in the city centre Cafe Tobruk is set in a quieter residential street. The outside has a fun and fresh exterior that includes a summer garden that platoons the exterior of the bar. The bartenders are friendly and the interior in contrast to the more classic exterior is modern and newly renovated. The food menu is delightful and diversified with a variety of international foods available. A lovely relaxed cafe that caters to the breakfast crowd, switches up to afternoon coffee, and is still there when the drinks turn to wine. What locals appreciate is the friendly nature where deep conversations between friends occur, and even strangers spark up conversations. If you are on your own there is a selection of English, German, and French books to browse. The service is great and the bartenders’ cheerful and good nature draws locals back time and time again. Even the railway station in Prague has its pub in it. This is a great place for strangers to gather to kill sometime between trains. The beers here are cheap and there is a grill with some snacks. During the day local bar flies frequent the place, but if you happen to be waiting for your train at night you may be surprised by full fledged concerts taking place in this rocking little train station bar. A pure Czech pub! Taste the total Czech beer Pilsner Urquell. 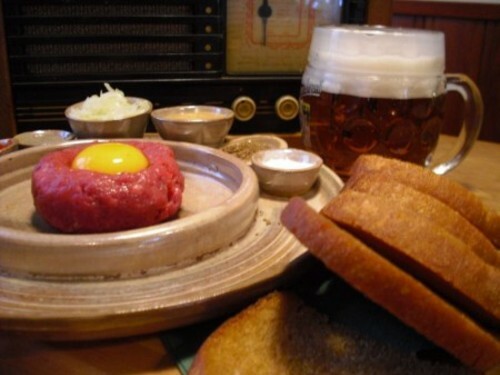 The locals recommend trying ‘Svickova’ which is a Czech favourite and comes served with dumplings. In the back is an outdoor garden that in the summer people stand in with their beers soaking in a lovely Prague day.